It’s a winter wonderland out there today. 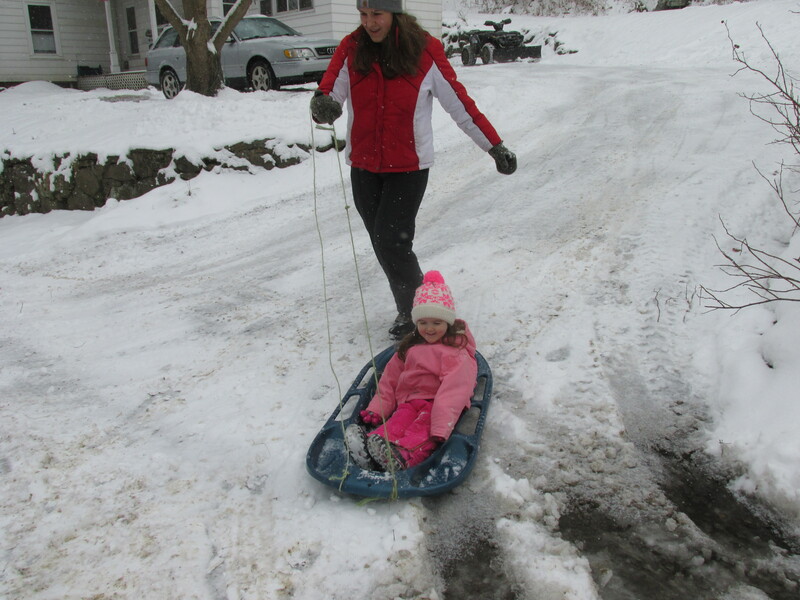 Lil was sledding and snow flakes flying through the air. 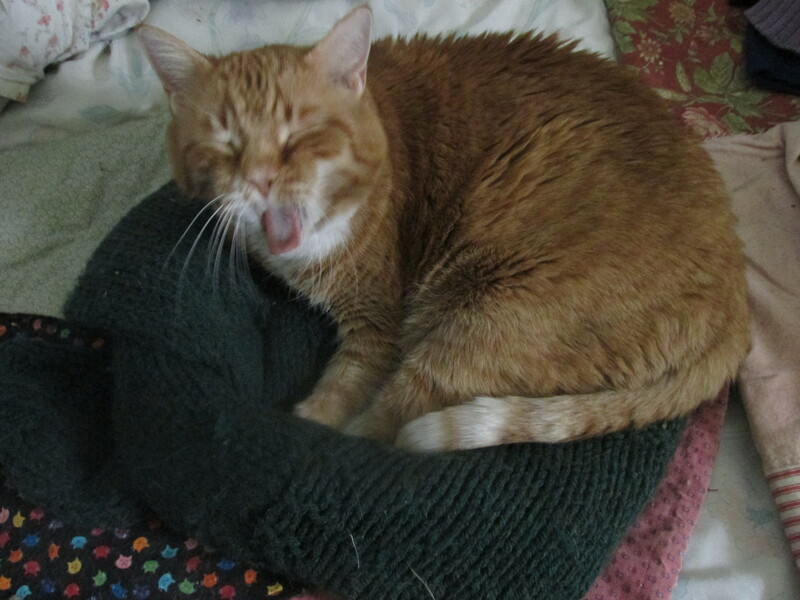 We are supposed to get bitter temps over the weekend so I will try and bundle up the house more. Last night I went up to feed the sheep later than usual around 7 pm. 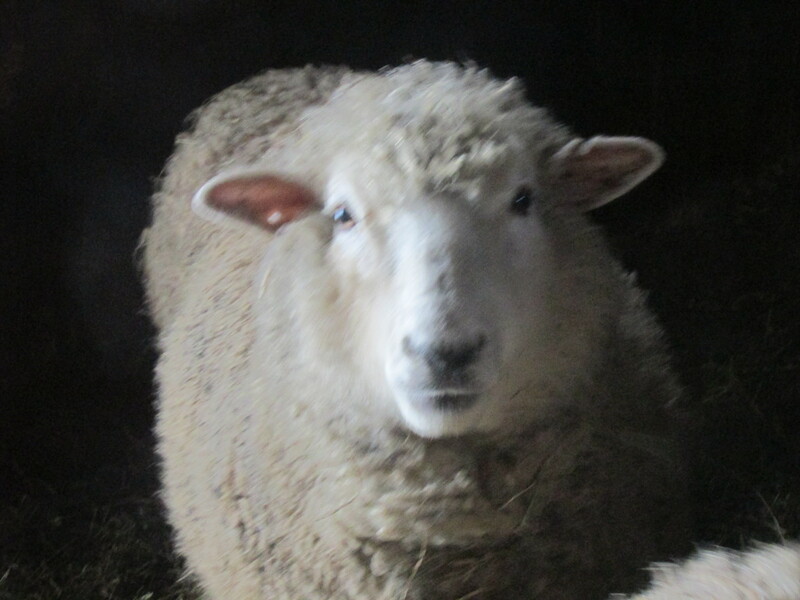 There were no sheep in the barn and it was so dark I couldn’t see them in the pasture. I called and called with no one baaing or coming.. With all the talk about coyotes and the recent article on FIBERuary about them I panicked. 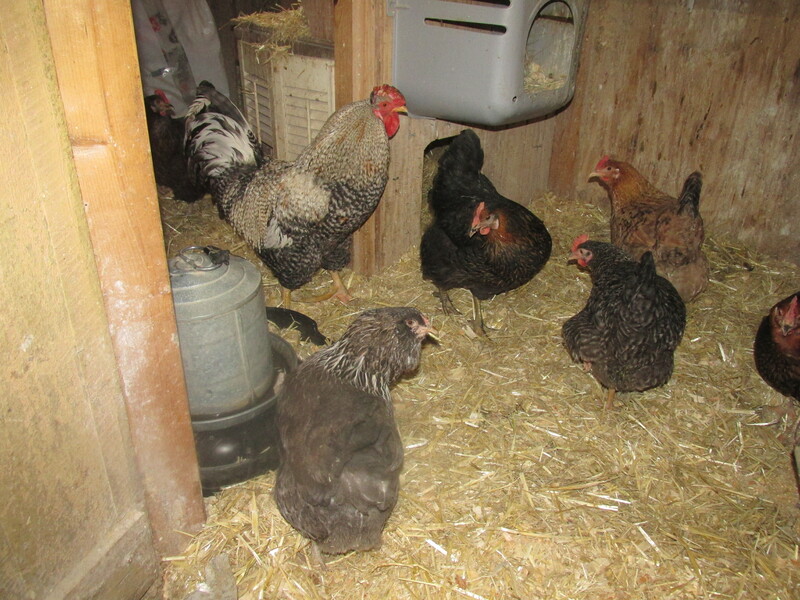 In a last ditch effort I opened the grain bin and they all came running covered with snow. This small flock has never been known to sleep outside. My Border Leicesters always did. 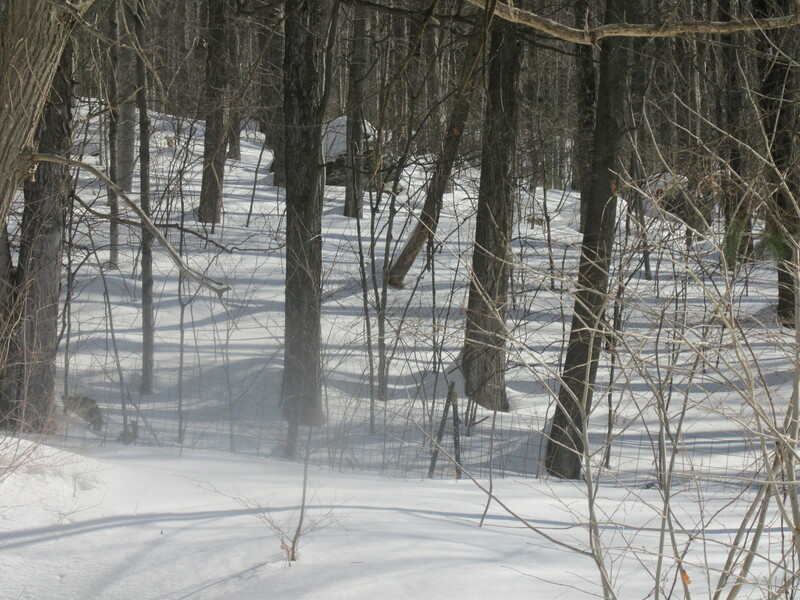 With coyotes around I am keeping them in at night and will be sure to get them in before dark from now on end. I am spinning everyday now trying to get all those bags of wool turned into yarn, and eventually into rugs, mittens, hats and scarves. 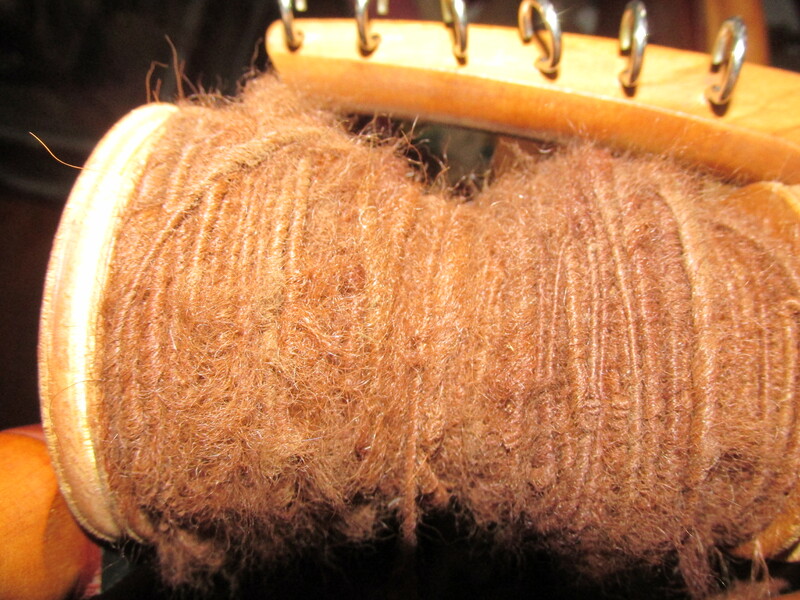 Yesterdays spinning was Alpaca, and I am almost finished with that bag. 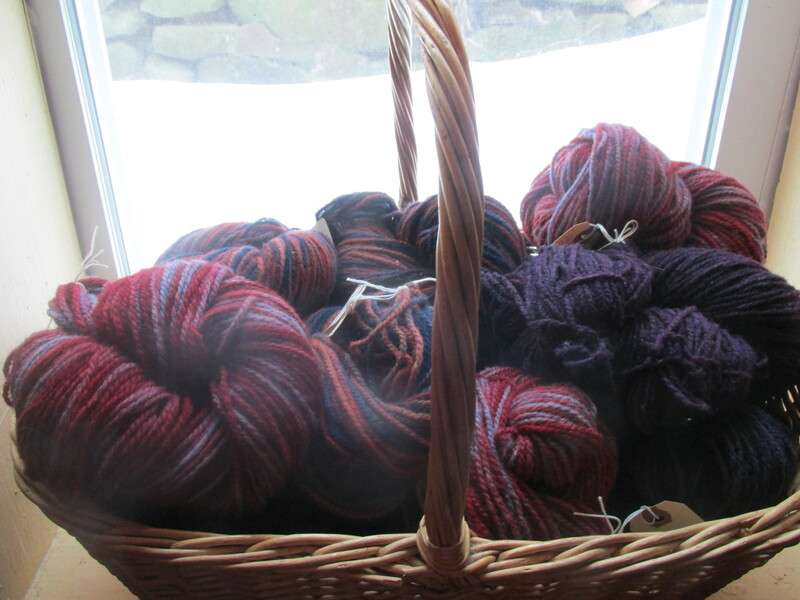 Still have one more bag of alpaca to spin which I will get started on today. I am going to ply it with a dark wool for added strength and then make a hoodie scarf with it. These past few days have been frigid. With wind gust from 30 to 40 miles per hour coming off the mountain, you can tell where the air leaks are in this old house! The winds have died down and the temps will go up to 30 today. 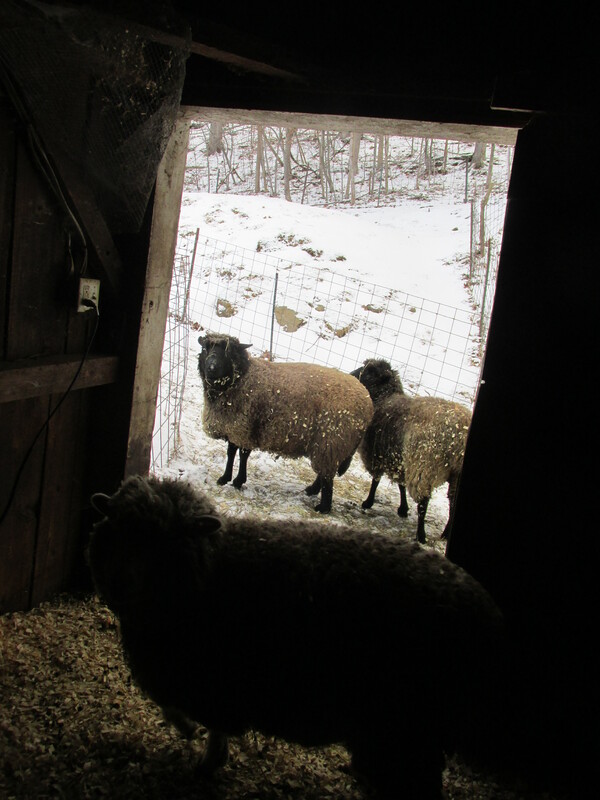 The sheep were toasty with their warm coats, some nice grain and the barn to selter them. She finally laid her first egg and its a beauty. Another Olive Egg Yea. 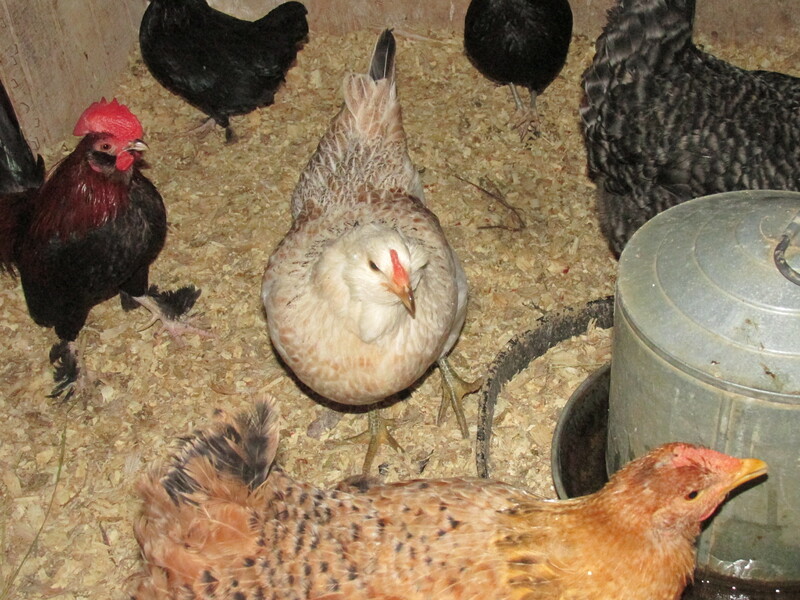 She is the white with brown hen. 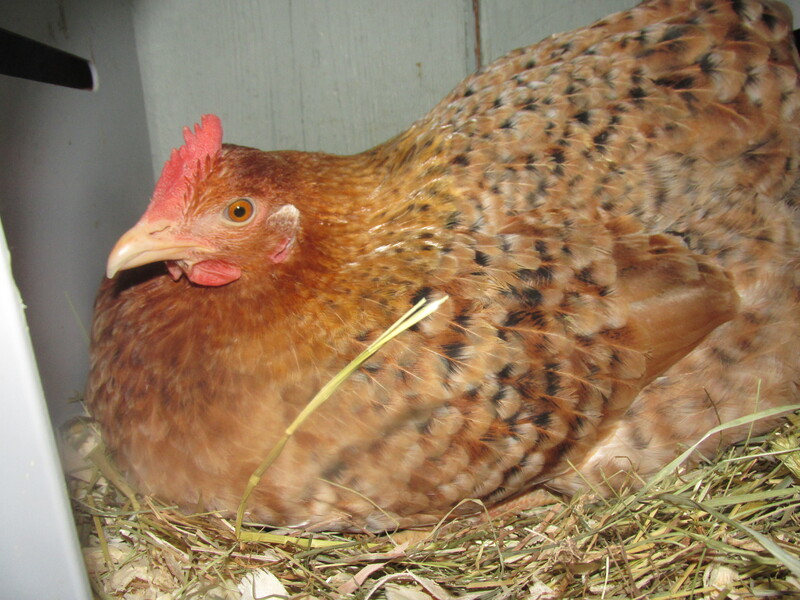 She has fit in with the crowd and knows to stay away from Samantha and Rosie who are the bossiest of hens. Anyone within a foot area of them gets a peck. Wish I had a separate area for them. But in life we all have to know how to stay clear of trouble Rosemary has learned that lesson. I have been on Instagram for some time now and thoroughly enjoy it. It’s a chance to share ideas, view other countries see other people’s pets and children and learn so much. Today while checking out new people to follow I came across something I want to share with you. A wonderful act of kindness. A picture venue was set up with a favorite, Beatrix Potter series laid out , a candle set on a sweet table. The Woman wrote my Mother read these books to me as a child as did her Mother to her. And on her death-bed I read them to her. This brought tears to my eyes as it did to many other readers. Such a simple act brought such comfort to her Mother. I reminder to us all it’s the simple acts of kindness that mean so much to us. 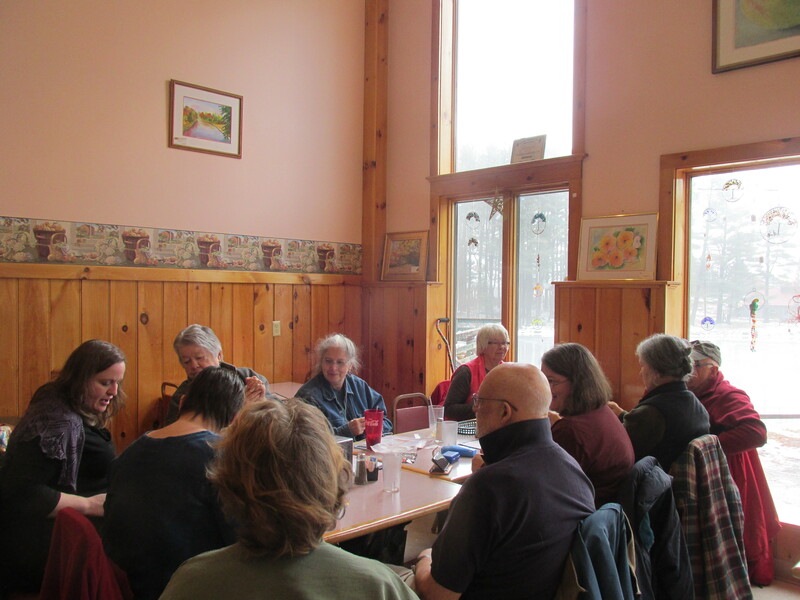 On most Saturday afternoons a group of knitters and other crafts people will be found at Pine Hill In Colrain. A get together of like-minded people to share their adventures in crafts and in life. Nice crowd last Saturday. 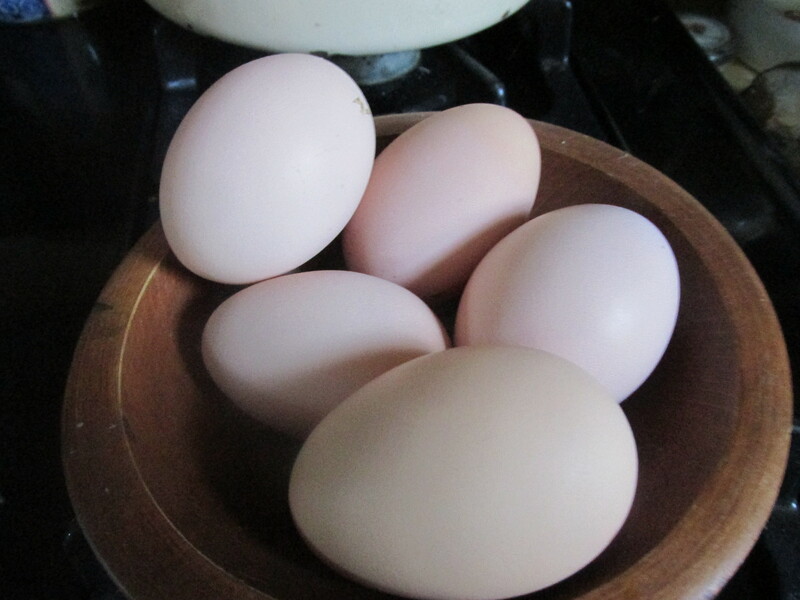 It was 7 below this morning but that didn’t stop the hens from laying 5 eggs before 9. I expect there will be a couple more later in the day.. The days are longer and the time will change on Sunday. The sky is a brilliant blue and the snow shadows are getting longer. 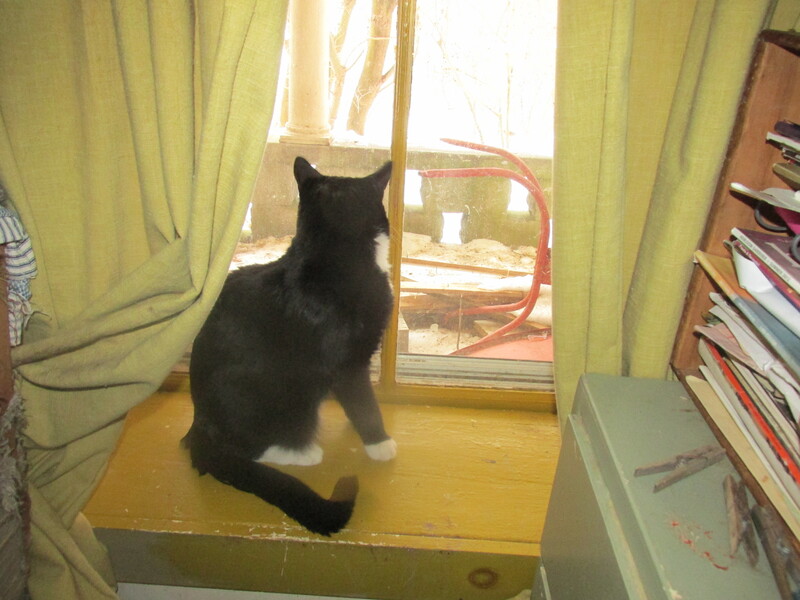 Sammy has been sending time bird watching. 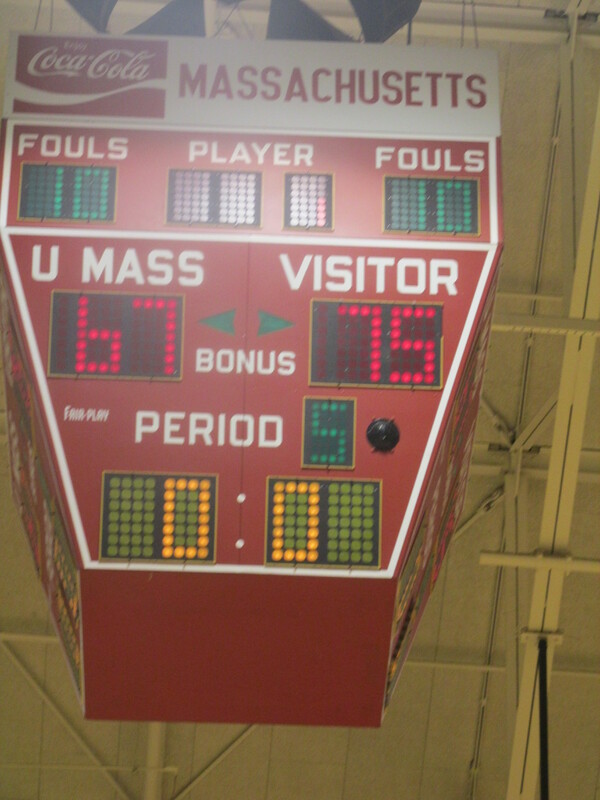 On Wednesday night Belchertown Girls basketball team played Longmeadow at The Cage at Umass in a semi-final. The game was a nail biter from start to finish. A dream of my Grand Daughter was to play at The Cage and her team won. Now on Saturday they will play Pittsfield in the final. The girls played a great game and showed good sportsmanship. 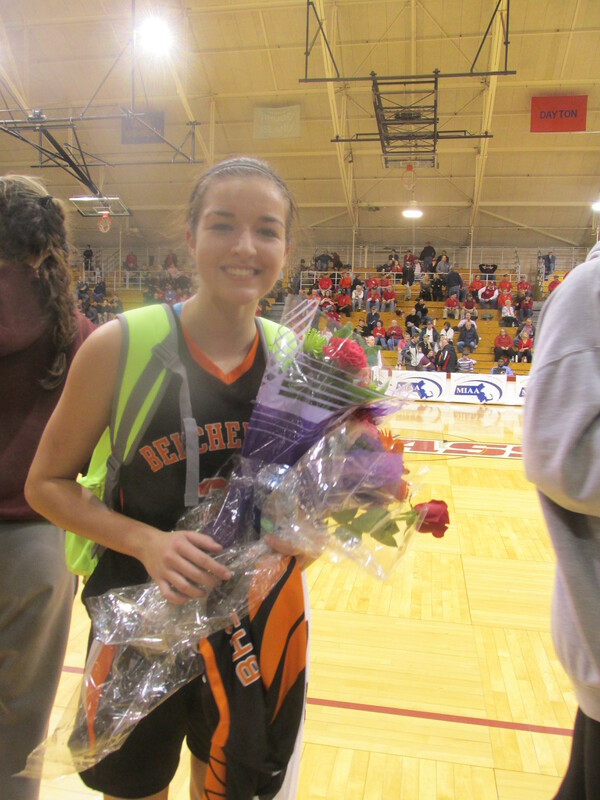 Good luck Belchertown Saturday night . I brought the yarn to Sheep and SHawl on Wednesday. The classes on spinning and drop spindling and hooking with yarn will be starting soon. SIgn up . Another cold night today then the weather warms a little. SOme snow flurries over the weekend. then tems in the high 30’s and freezing at night. 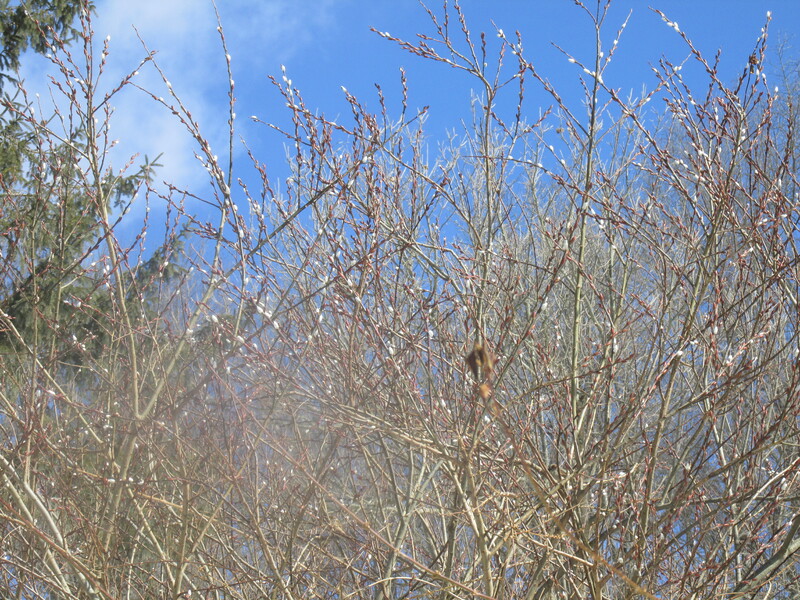 Good Maple Syrup weather and sounds like a slow thaw. 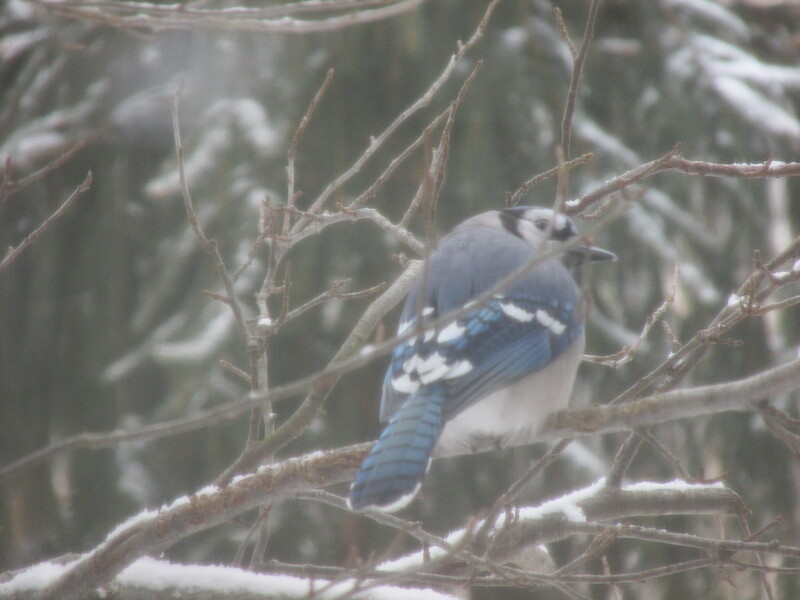 This morning looking out my kitchen window I saw two Blue Jays sitting on a branch of the crabapple tree. ONe was feeding the other a sunflower seed. It’s these small things that makes a sometimes difficult life on the farm worth it. 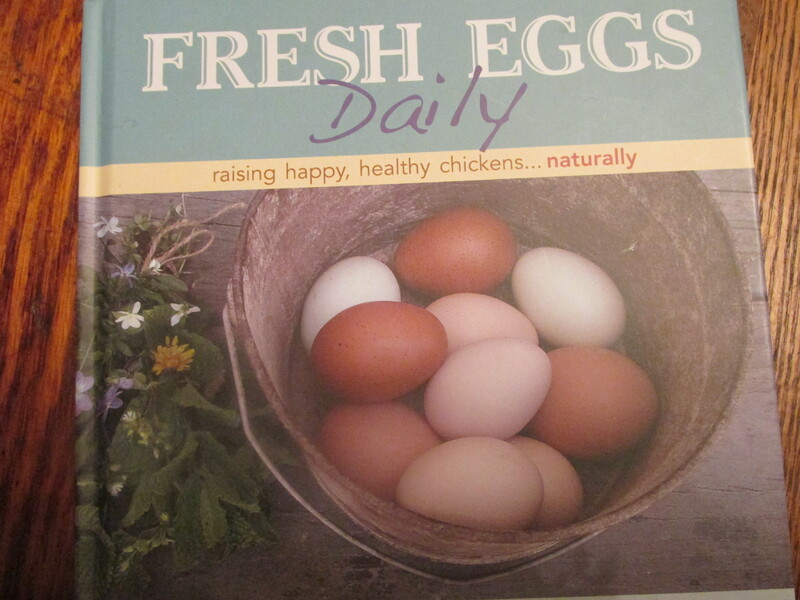 If you can afford only one book about raising chickens get this one. 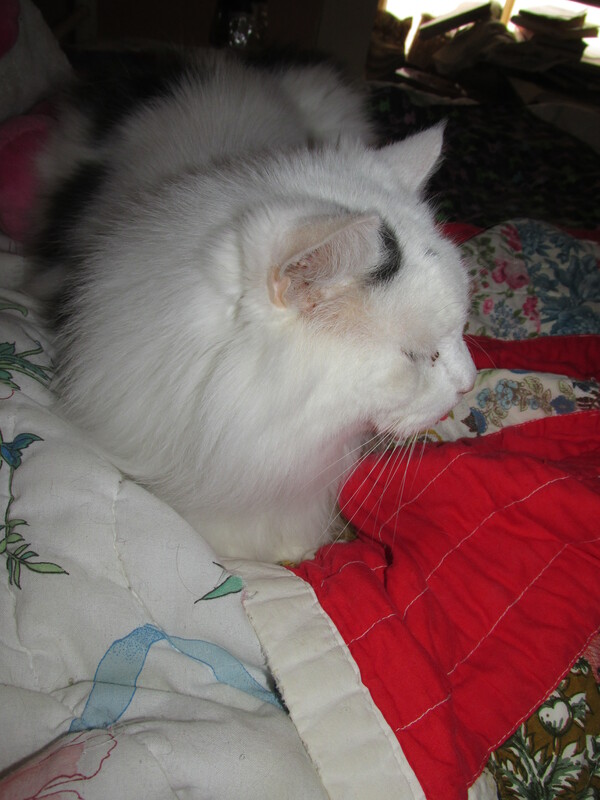 I found her blog online when Hazel got the respiratory thing again and followed her advise about herbs. WIthin a week he was better and I continued the herbs for another week, It was amazing. I wanted to know more and her book has it all. She raises her chicken holistically like I do. Her practical tips for good diets and health issues and what to have on hand for an emergency is priceless. I took this picture early this morning. She is content on the nest and laid a beautiful egg. It was supposed to get up to the mid 20’s today but that never happened. The winds came up around noontime and are still howling. You can’t be outside long on this day. 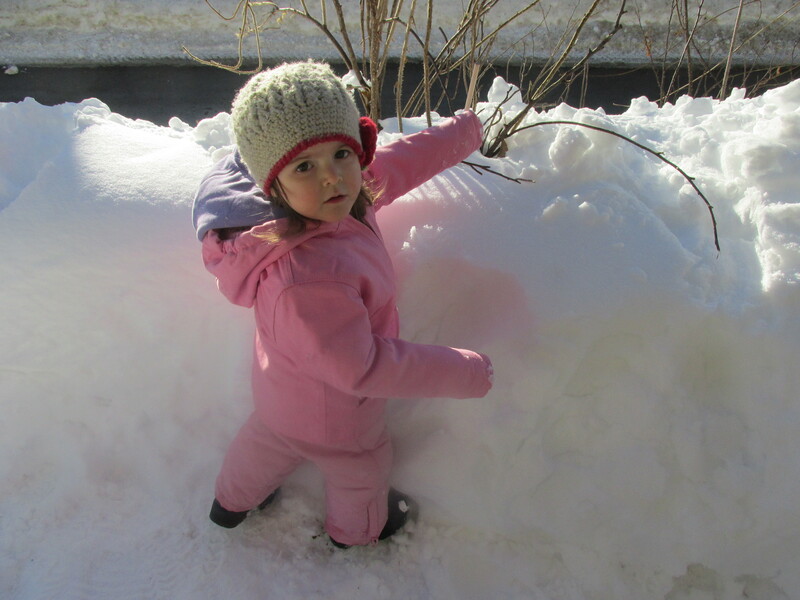 The last snowstorm left us with 4 inches. It snowed for almost 36 hours so I was sure we would get a lot. A pleasant surprise. 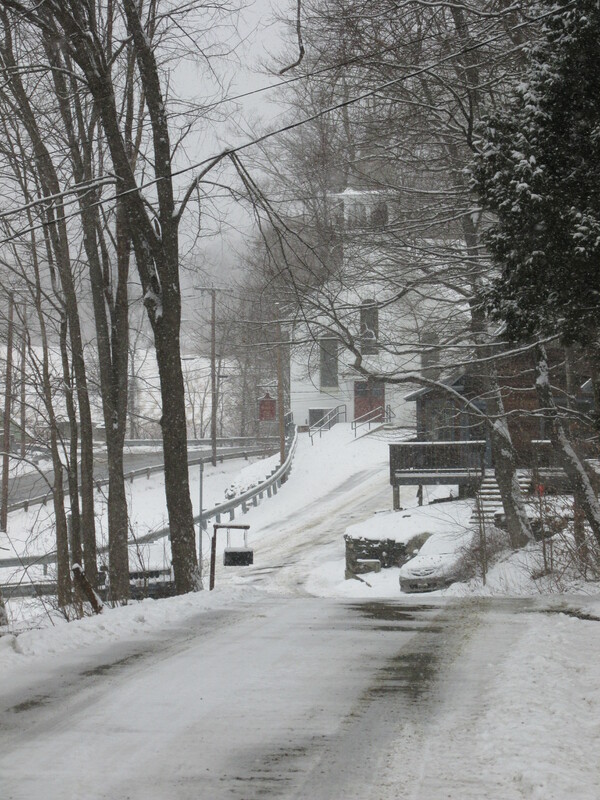 Its going to snow tonight into tomorrow with 2 – 4 inches and again over the weekend. But today after temps below zero its suppose to get into the mid twenties. On the good side of things oil prices are low so that helps out in the heating department. 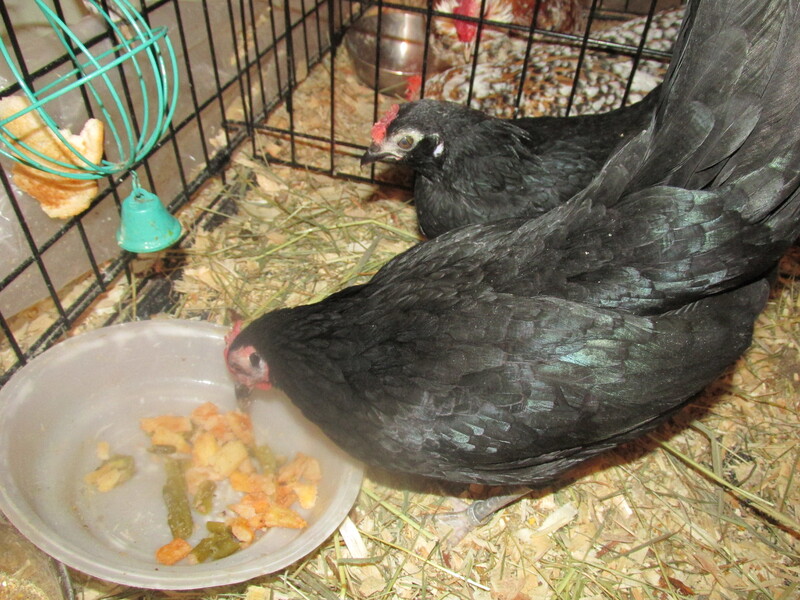 Morticia is eating and Violet is waiting for her turn. 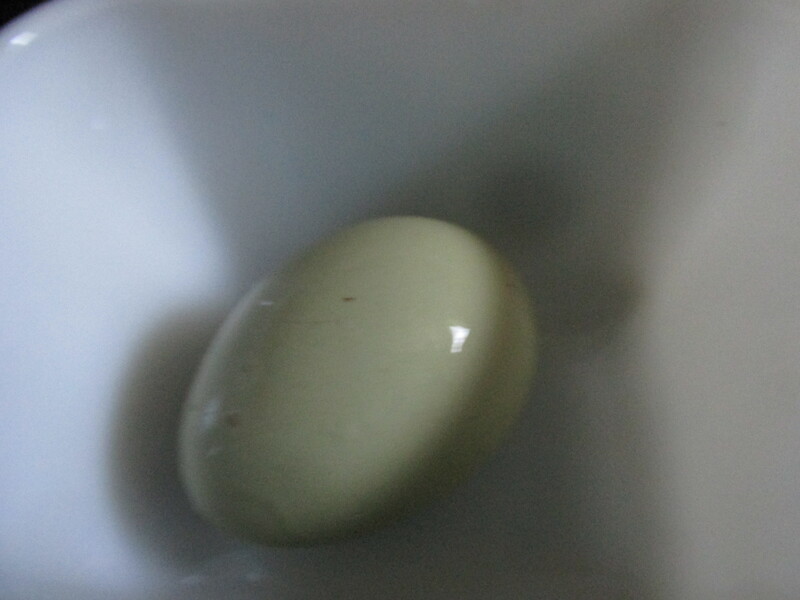 Violet laid her first egg yesterday. Its small but shaped like her Mom’s. 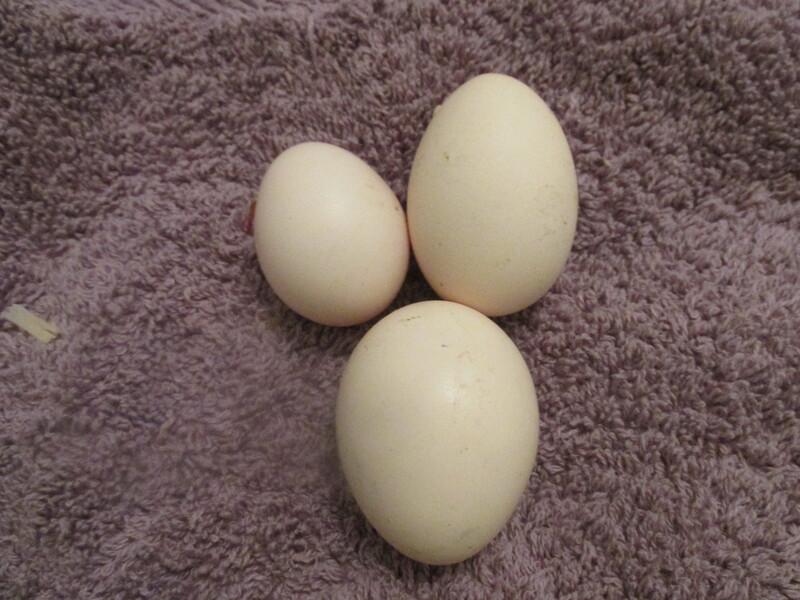 I have included a picture of VIolets egg, her Mom’s and Mrs. Brown’s. Violet’s egg with her Mothers on top. Mrs. Brown is on the bottom. Mrs. Brown’s eggs are always plumper. .Eggs are interesting and if you purchase eggs in the store all the time they all look the same. But buying from a local farmer or raising your own you notice how each eggs is different and in families the egg shape stays the same. I wonder why in the U.S. eggs and fruit have to be perfect. In nature and on organic farms they are not. They are just as good though. Chris and I are working on cleaning the barn. It’s really too cold to spend a lot of time in there. We have been spending and hour or so a day. Today we are getting 10 bales of hay from Joe. He doesn’t have much left. 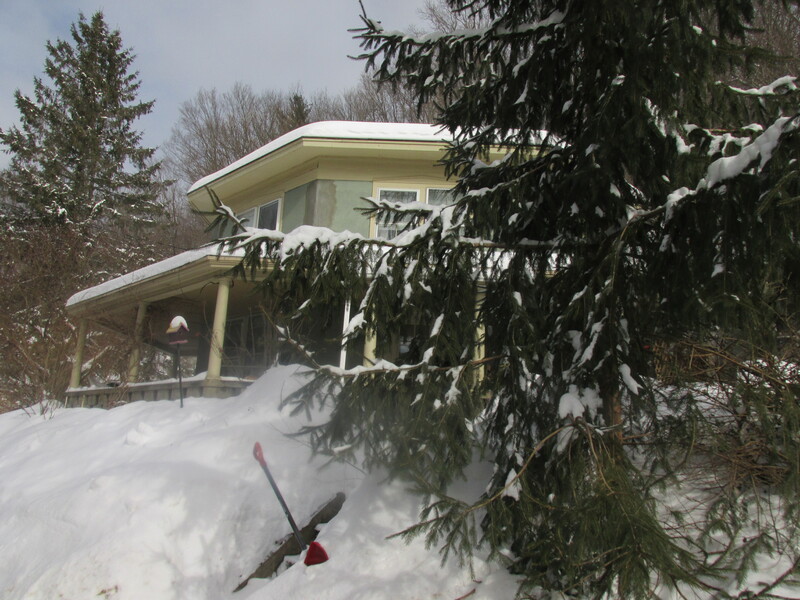 I have shoveled the to the top of the small hill in back and plan to get sandbags to lay across it. HOping that will make a difference in water coming into the barn. I hope we have a slow snow melt. We brought Helen in last night, she has an impacted crop. Some hens are susceptible to this. SHe was getting beat up on by the rooster who is kind to the other hen. He will spend next winter in the barn by himself. I am massaging her crop and hopefully moving things through and she is getting only yogurt and boiled egg for the next 24 hours. I will massage her crop tonight too. She is a sweet girl hope she can get through this.. This is the last cage I have so I hope that everyone else can stay in the coop!!!!!!!!! 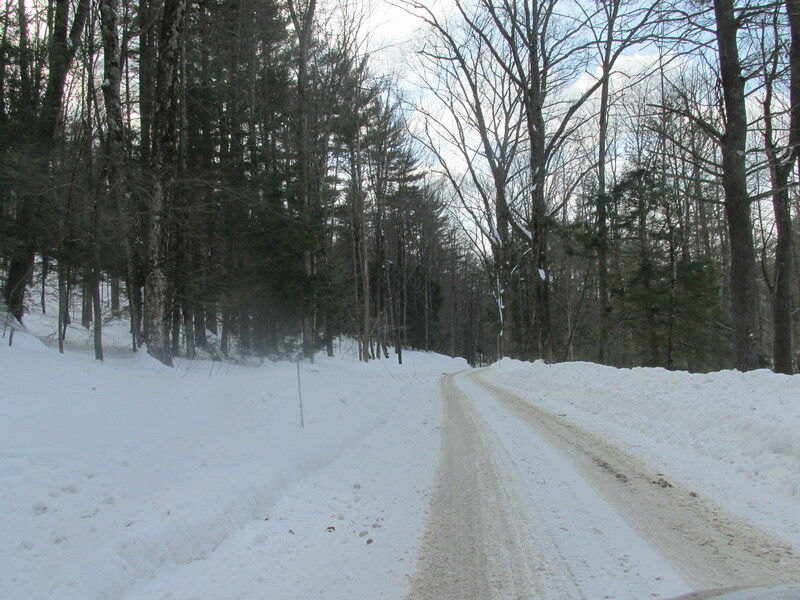 The 3 day storm left us with well over a foot of snow. We did find room to put it, more is expected on Thursday into Friday. 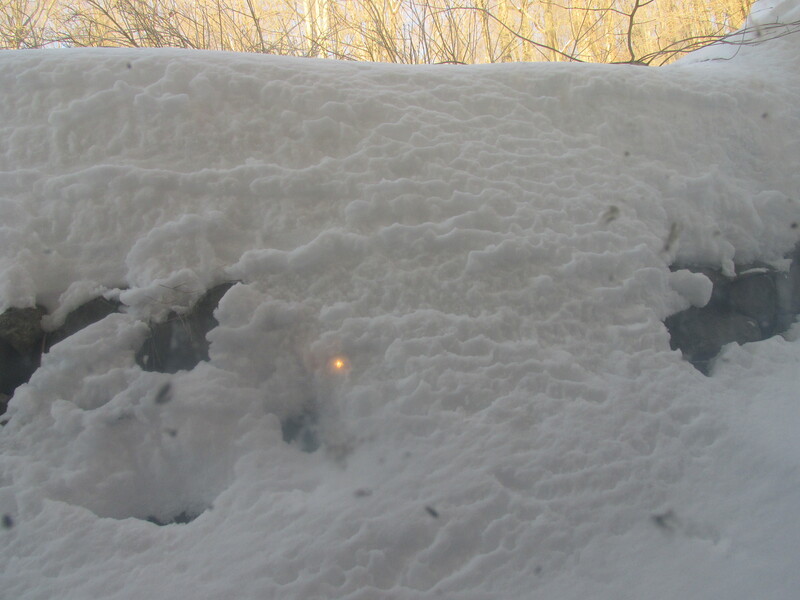 I don’t mind the snow so much but its the bone chilling below zero temps that bother me. Anyone who has spent a good deal of time outside may have had some finger frostbite. This bitter cold plays havoc with that. 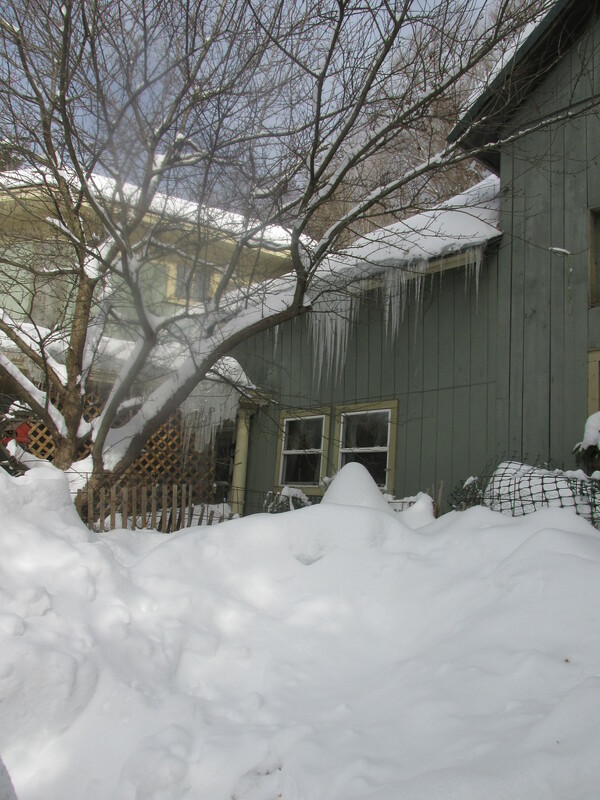 Snow gives one a chance to see what is coming to your property I have rabbits, raccoons and all sorts of birds moles too Of course neighbors cats come too. 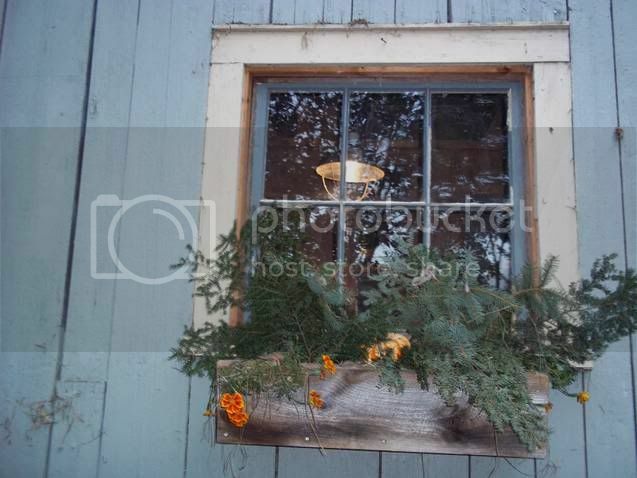 What’s on your property? Lots of ice this year. Today is senior lunch day. I look forward to it each month. It’s a chance for me to meet people in town. A good meal and good conversation. Its educational too with people talking about health insurance and local events. 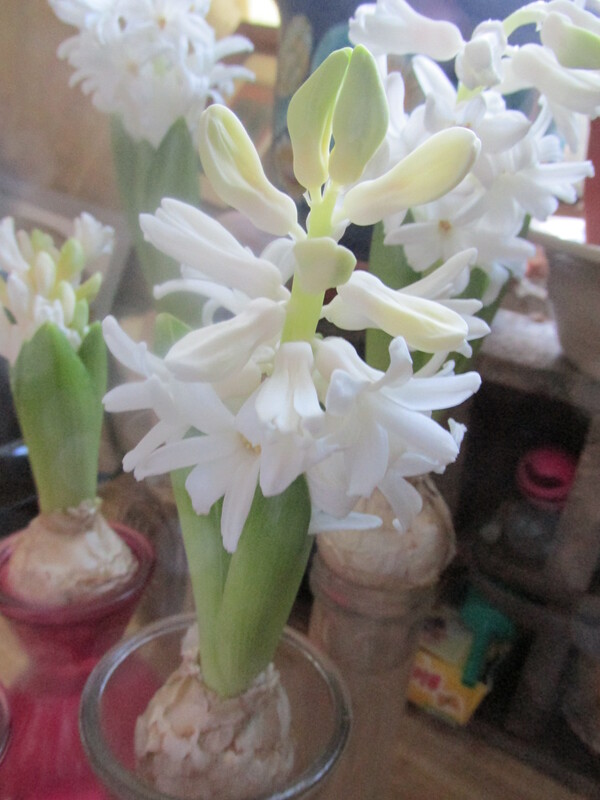 The grouping of hyacinth’s has made my kitchen smell wonderful and spring like.I like the grouping idea so much that I plan to do it in a few more rooms next year. 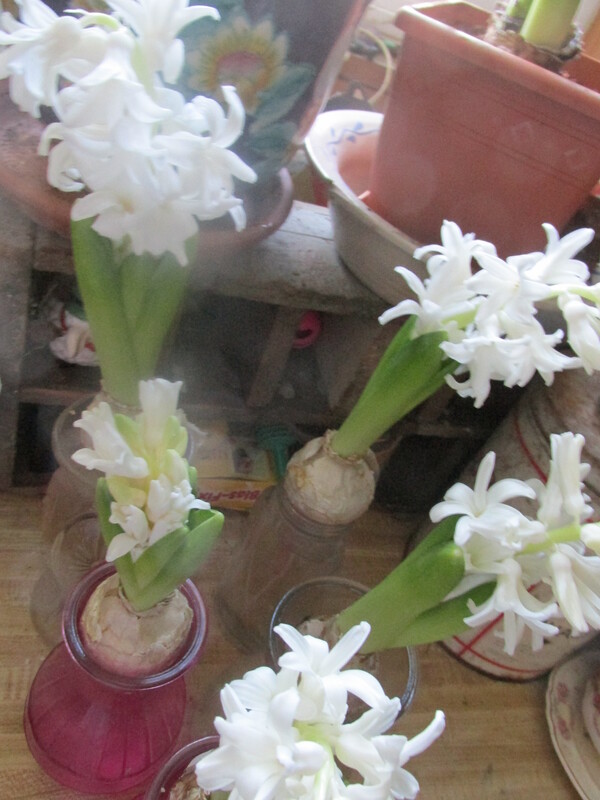 Just what I need to get rid of the winter drearies. 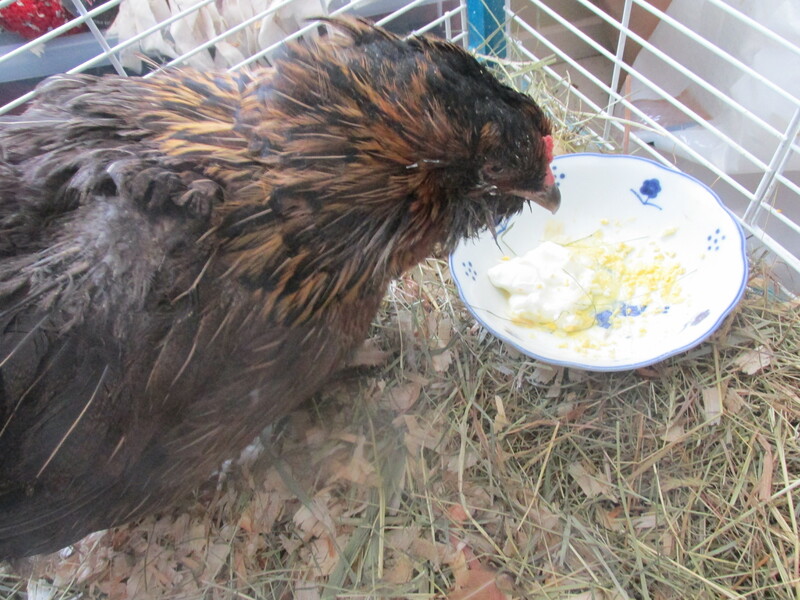 Yesterday I made yogurt for the chickens. 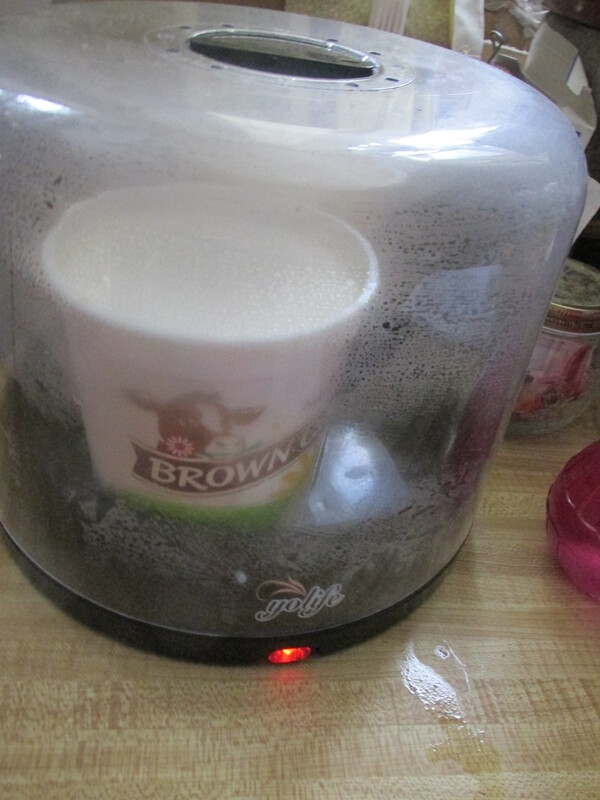 Its good for them and a good way to use up milk that has gone a little off. I seem to be making a lot more these days.